French Emblems: Emblem: Deum & ama & time. Deum & ama & time. Both love and fear God. Sphingem biformem dedicavit, symbolum Dei. Rursus time, ut vindex inexorabile impiis. Memphis, devoted to the Mysteries, set up a statue of the hybrid Sphinx in front of the sacred temple, as a symbol of God. Love God as being mild and slow to anger with the holy; But just as much fear Him, as being inexorable as an avenger on the unholy. virginis formam prae se tulisse scribens, & Clemens. eadem gens dederit; de quo diximus embl. XIII. An Aristophanean iambic tetrameter brachycatalectic monocolon. 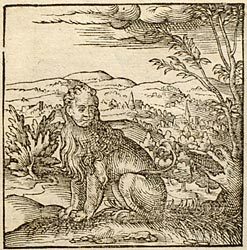 Psellus talks in his allegories of a two-formed monster, with the appearance of a beautiful girl down to the navel, and the rest shaggy, with a rather long tail, and the feet of a wild beast; and its tongue being ‘very Attic and Pythagorean’, that is to say, eloquent and wise. Aelian, too, in bk. 12 of On Animals, ch. 7, records that it was carved and sculpted by the Egyptians as diphue kai dimorphon, that is two-formed and consisting of a double nature, a mixture of a lion’s and a girl’s body conflated together; and he confirms this on the authority of Euripides. Supporting this version are Origen, Against Celsus, bk. 1 - who writes that she has the form of a maid in front, this being one half of her - and Clement. [p.132] Now Diodorus Siculus and Pliny (supported by Solinus) count Sphinxes among the race of Monkeys, as having shaggy hair and rather prominent breasts, and being docile; which is nothing to our purpose, except in that the tales of a two-formed monster confirm it. I could mention that Dio Chrysostom explains the Sphinx as an allegory of ignorance; whereas Psellus sees it as standing for man that is made up of contradictory parts, since one part of us has the faculty of reason, but the other part is endowed with a brute nature. We now come to the emblem, which I give from a passage of Clement of Alexandria. The Sphinx (he says in bk. 5 of the Stromata), was set up as a statue by in Egypt in front of temples; either because the whole subject of theology is wrapped deep in mystery, and is dark and impenetrable to human thought; or because we are bound to love and fear God in equal measure - that is, to love him as being merciful and benevolent to the righteous, and to fear him, as he inexorably metes out their just deserts to the wicked for their wrongdoings. In the same way that the Sphinx has both a human and a bestial appearance in equal measure: so that, to be sure, her bestial appearance suggests a fearful harshness and severity in exacting their punishments from the wicked, while her human side implies an easy-going and easily-found clemency towards the righteous. In the emblem, I have followed this interpretation, [p.133] although Synesius, bishop of Ptolemais, a man of great learning, gives an alternative explanation in his book On the Kingdom, and he repeats it in his books On Providence, somewhat to this effect: that the Egyptian people consecrated a statue of a Sphinx in front of their temples, so as to represent a sacred symbol of the united virtues of strength and wisdom, since the appearance of a wild beast stands for strength, and that of a human girl for wisdom: for strength devoid of wisdom to guide it, takes decisions and jumps to judgments too rashly and speedily, throwing everything into chaos and confusion; but likewise intelligence and industriousness and prudence, however great, if they have not hands to serve them, are useless and frail. But I reject this interpretation for the reason that the same people [the Egyptians] had another emblem for this, which I have discussed in emblem XIII ([FJUb013]). 1. Greek mythographer, one of several mentioned by Suidas. 2. Probably Michael Psellus, the 11th-century poet and historian. 3. See emblem XLI ([FJUb041]). 4. Synesius, Bishop of Ptolemais (capital of Cyrenaica), neo-Platonist, wrote about good government (d. c. 414).